Well, don’t blame the artist for any unfortunate anachronisms. Blame the folks who planned Victoria’s streets. 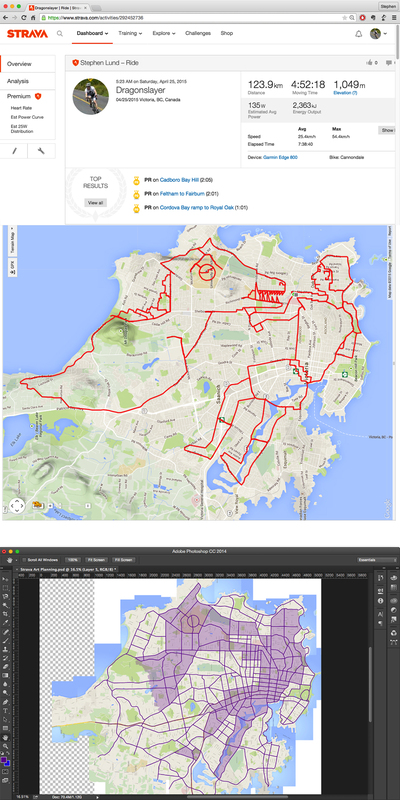 Like many of my Strava art pictures – including my Strava giraffe (see The Art of Giraffe Spotting) – the general shape for this one simply emerged from the map after I highlighted the city’s main streets. (See lower image at right). All I had to do was flesh out the details. This entry was posted in gps art and tagged creativity, cycling, dragon, dragonslayer, garmin, gps, gps art, St. George, strava, strava art, victoria bc. Bookmark the permalink.